Essentially there are two Business Process Management (BPM) approaches for process improvement. The traditional approach , is based on analyzing an existing process and then applying lessons learned to improve the process based on stated goals (reduce time/cost, gain quality/flexibility, and/or tightening controls). The result of the traditional approach is incremental improvements to an existing process. 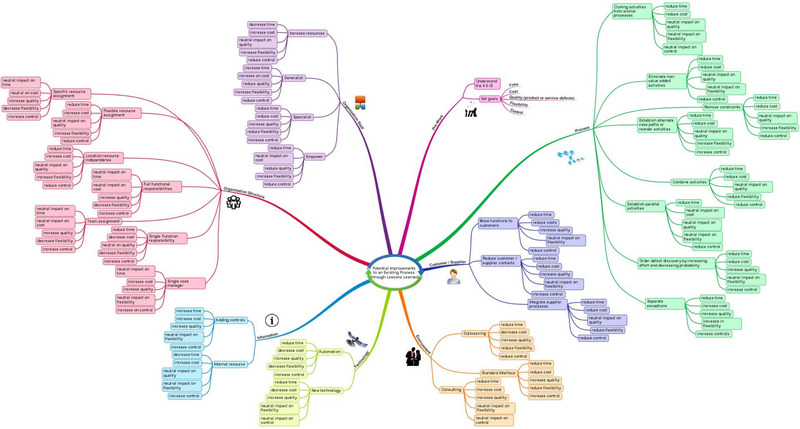 See below mind map (Figure 1). Product-Based design is a radical approach to process improvement. Instead of analyzing an existing process, it ignores the existing process. It starts with a clean process slate and focuses on the specification of the final process product or service to guide its effort. See Figure 2 below. PBD assumes that the final product is correct (i.e., provides customer value); this is process redesign – not product redesign. PBD is more appropriate than traditional process improvement when a business needs a dramatic change to remain competitive or even continue to exist in the marketplace. PBD can also be the method of choice when there is no existing process (new product) or the existing process is undocumented. PBD still needs performance measurements from the existing process to support a credible business case that justifies the redesign effort. PBD consists of five steps similar to the traditional approach. The real difference between them is in the analysis step. Note that the five steps are an iterative life cycle. The future analysis step may change to the traditional process improvement approach. Define – determine the goals (reduce time/cost, gain quality/flexibility, tightening controls with measurements). Analyze – decompose the product specification into data elements and identify the associated business rules. This is called a Product Data Model ; this is similar to a Logical Data Model except it only covers a product. Associate a process activity with each data element, then sequence the process activities and decisions per the business rules; note that business rules may be challenged. Draw a process map with one of the standard diagraming techniques (e.g., Business Process Modeling and Notation/Decision Modeling and Notation - BPMN/DMN ). The business analyst team may construct the initial process with the purpose of minimizing total process time through parallel activities and/or minimizing total process cost through serial value-added activities. Evaluate – conduct a gap analysis, compare existing and redesign process measurements, and build a credible business case. Implement – establish urgency for change, manage resistance, train staff, and implement the redesigned process. Control – create a dashboard (leading/lagging process indicators ) for the process owner to manage the redesigned process. The dashboard typically consists of trend and control reports. Our example is a consulting business experiencing cash flow problems. Essentially, the business is issuing invoices to customers late. So late that the Chief Financial Officer (CFO) has determined that the business is 6 months away from filing for bankruptcy. The CFO requests your services as a Business Analyst (BA) to recruit a team to redesign the invoicing process. The CFO advises you that the business product, the invoice, continues to meet both the business and customer needs for billing. But, due to the business urgency, the CFO specifically says, “redesign” the process with a goal of reducing the time to invoice by 80%. Your team decides to capture these data elements in a Logical Data Model  (entities, attributes, and relationships). See Figure 3 below. Using the business rules (contained in tables in the DMN Business Knowledge shape – Expense Approval Levels), your team sequences the activities along with needed gateways for alternate/exception routing in a BPMN/DMN process map (note “+” activity type, sub processes are collapsed). Some data elements may require multiple activities and may be in parallel depending on the business rules. Your team will add pools and swim lanes later after the redesigned process is stable; note when there is no existing process (or ignoring it as in redesign), it is a best practice to establish the process first and then add the pools and swim lanes (actors) later. With a draft of the redesigned process, you now can evaluate it against the goals. You may follow-up with the traditional approach techniques (see Figure 1). Assuming the goals are achieved, you proceed to implement the process along with the process owner dashboard. CROM, P.J.N. and REIJERS, H.A. (2001): Using prototyping in a product-driven design of business processes. Proc. of the Open Enterprise Solutions: Systems, Experiences, and Organizations Conference, Rome, 41-47, Luiss Edizione.